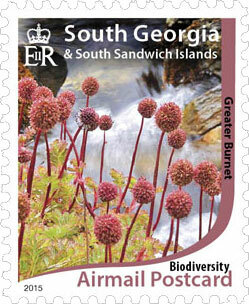 During January, Her Royal Highness The Princess Royal paid her first official visit to the Island of South Georgia. After first staying and carrying out public engagements in Stanley, Falkland Islands, she travelled to South Georgia on board MV Pharos SG. 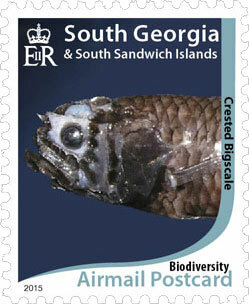 She last visited South Georgia in March 2009 in her capacity as Patron of the South Georgia Heritage Trust (SGHT). 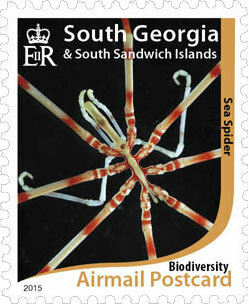 During the visit The Princess Royal had the opportunity to see at first-hand the unique environment and heritage of South Georgia, discuss the work of the Government and its partners on these and other issues, formally open the new Post Office in the restored ‘Slop Chest’ building and mark the centenary of Shackleton’s crossing of the island. The full report, published previously on this website, can be read here. 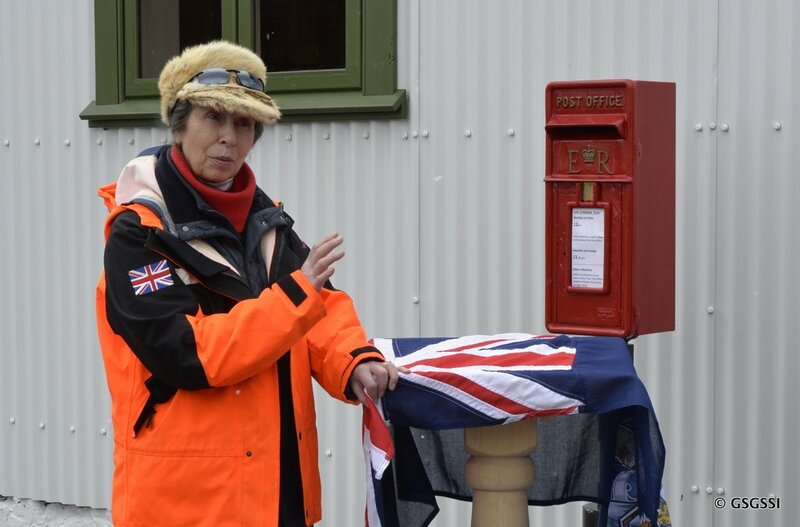 To mark the 100th anniversary of Shackleton’s Imperial Trans Antarctic Expedition the Grytviken ‘Enduring Eye’ Exhibition was opened to the public as part of the formal opening of the restored ‘Slop Chest’ building at Grytviken by Her Royal Highness The Princess Royal. The Grytviken Exhibition was developed with the assistance from the Royal Geographical Society (RGS) following GSGSSI’s support for the RGS’s current principal ‘Enduring Eye’ Exhibition in London, which features Frank Hurley’s original glass photographic plates from the 1914-16 expedition and his subsequent return to South Georgia. The Grytviken exhibition, which is located in an impressively refurbished new gallery to the rear of the ‘Slop Chest’ includes 10 replica glass photographic plates, with associated enlarged mounted prints and, most significantly, 12 original Hurley lantern slides, which are on temporary loan to GSGSSI from the RGS. GSGSSI wishes to thank the RGS and the Stanley Print Shop for all their assistance in the development of this exhibition. 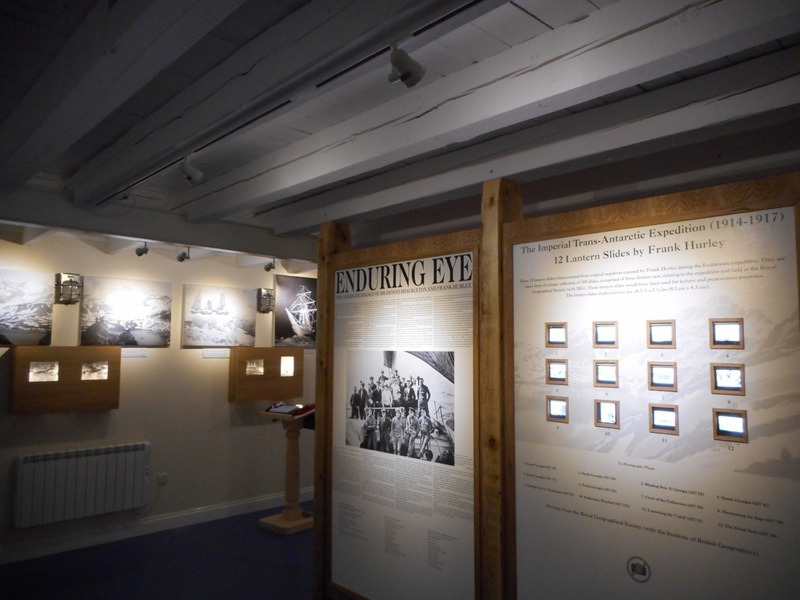 In conjunction with the opening of the Grytviken ‘Enduring Eye’ exhibition, the Government’s Whaling Station multimedia interactive kiosk was commissioned in conjunction with the formal opening of the refurbished ‘Slop Chest’ by Her Royal Highness The Princess Royal. Situated in the relocated Post Office, the multimedia kiosk utilises imagery recorded during the course of recent LIDAR laser surveys of the former whaling stations by Geometria Ltd of New Zealand. The laser surveys (and the refurbishment of the former ‘Slop Chest’) were funded by GSGSSI and the Norwegian Ministry of Foreign Affairs through the Directorate for Cultural Heritage as a means of creating a long-term visual archive of the historic whaling stations before their condition deteriorates any further. Given that, with the exception of Grytviken, visitors are not permitted to enter the now-unsafe whaling stations, the interactive kiosk enables visitors to navigate visually through the stations and gain a real appreciation of the scale of the industrial heritage. The kiosk operating system, which was developed by Bristol-based Shadow Industries Ltd, allows the user to select either Grytviken, Leith, Husvik or Stromness. In the case of the first two, the user is also able to view and watch integrated historical images, films and interviews with former Whalers both in English and Norwegian. Two similar kiosks are delivered to the Fram Museum in Oslo and the Sandefjord Whaling Museum. The Norwegian Government’s contribution and support to this project have been appreciated greatly by GSGSSI. 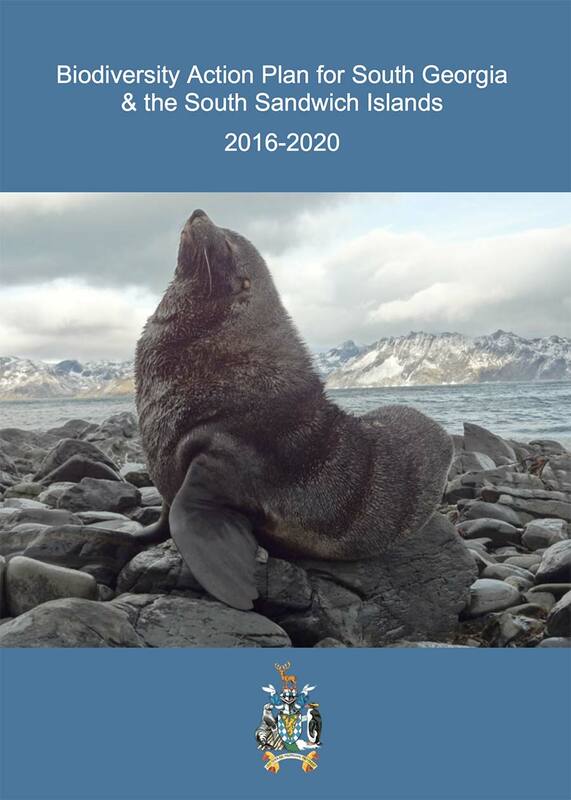 The Strategy for SGSSI 2016-2020 sets out a commitment to produce a National Biodiversity Action Plan (NBAP) detailing how GSGSSI propose to meet environmental objectives and obligations under the Convention on Biological Diversity. GSGSSI has been consulting on the draft NBAP. While the main objectives set out within the NBAP stem from the Strategy and have, therefore, already been the subject of extensive consultation, the NBAP also sets out in detail how they will be implemented including by working with, and through, our stakeholders. A final version of the NBAP is now being developed following the consultation phase. The consultation document can be downloaded here. The Convention on Biological Diversity (CBD) aims to conserve biological diversity, promote sustainable use of its components and ensure fair and equitable sharing of benefits arising from genetic resources. It was signed by the UK in 1992 and ratified in 1994. 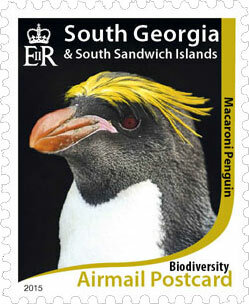 On the 27th March 2015, GSGSSI announced that the CBD would be extended to South Georgia & the South Sandwich Islands. 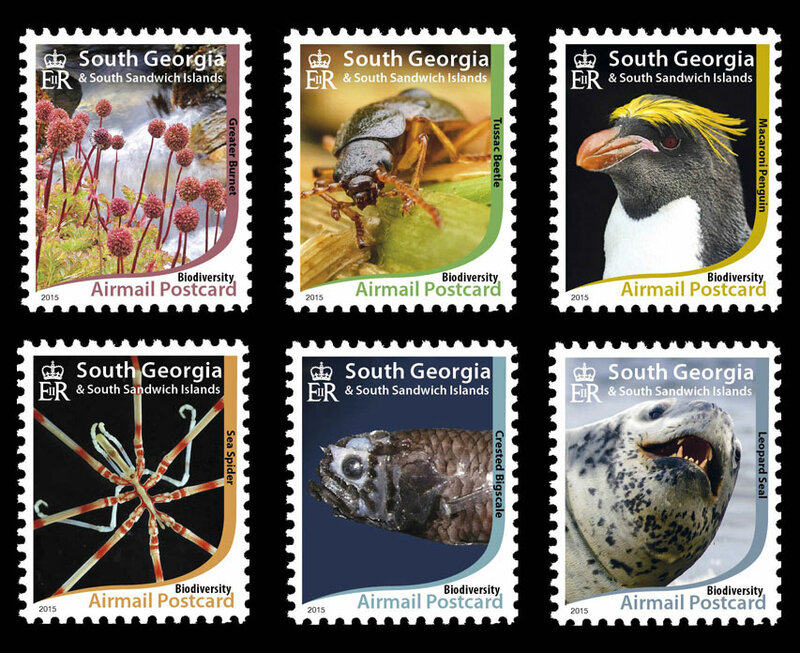 To celebrate the extension of the CBD to South Georgia & the South Sandwich Islands, GSGSSI has commissioned a stamp set that illustrates the richness of the Territory’s biodiversity. 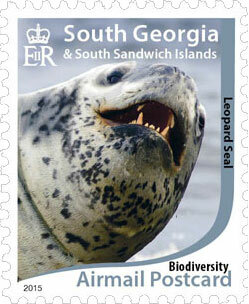 A ferocious predator that spends most of its life in the pack ice, leopard seals are common visitors to South Georgia in the winter months. Named for the black spots on the fur around their neck, these solitary animals feed on seals and penguins and can often been seen lurking off colonies on the look out for unwary prey. 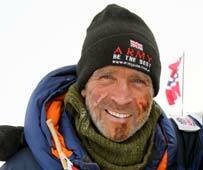 Antarctic Explorer Henry Worsley died on the 24th January after developing a serious infection as he tried to cross Antarctica unaided. Mr Worsley, 55, was following in the footsteps of his hero, Sir Ernest Shackleton, 100 years later. Henry undertook his solo expedition in the spirit of his idol Sir Ernest Shackleton and was delighted to have exceeded his goal of raising over £100,000 for the Endeavour Fund, a charity founded to help the recovery of injured servicemen and women. He was fulfilling his dream of crossing the Antarctic continent, and after having walked 913 statute miles unsupported and unassisted, battling extreme weather conditions, he made the brave decision, in Shackleton’s words, to “shoot the bolt”, 30 miles short of his ultimate goal. Donations can be made to the Endeavour Fund here. There has been a further sign that the South Georgia rat eradication project is showing real results. BAS Terrestrial Biologist, Jamie Coleman, has discovered a nest at Burnet Cove in Maiviken. Jamie reports that there are at least four pairs of pipits at Maiviken now. 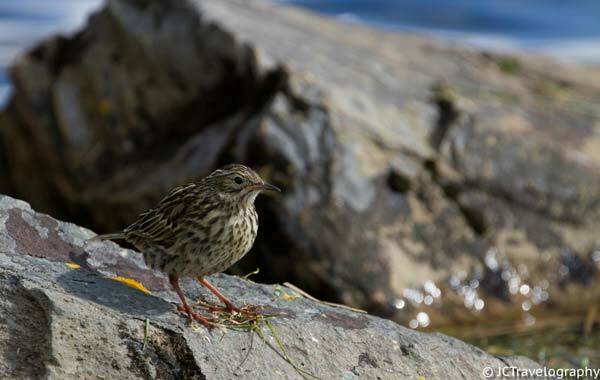 The South Georgia Pipit, endemic to the island, is considered a significant indicator species for the success of the removal of rats. This area was baited in 2011 at the start of the South Georgia Heritage Trust multi-million pound project. Pipit recolonisation is exciting news for all involved. In line with its Strategy commitment GSGSSI is developing its policy library. GSGSSI’s latest policy statements have been published on the website. These cover Passenger Landing Fees Exclusion, Scattering of Ashes, Gifts and Hospitality, Fresh Produce Ordering and Biosecurity Checks. They can be downloaded from the GSGSSI document section here. 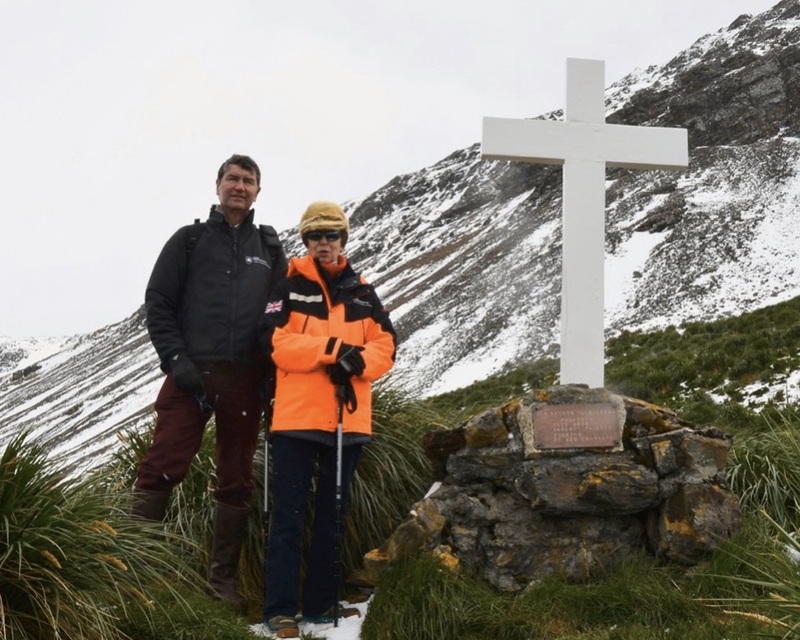 During the course of her first official visit to South Georgia, Her Royal Highness The Princess Royal visited Shackleton’s grave and memorial cross and took in the landing site of the James Caird in King Haakon Bay. Shackleton and his comrades landed there in May 1916 after their 16 day boat journey from Elephant Island. See report above. The Royal Mail issued eight unique stamps of images taken by Shackleton’s official photographer, Frank Hurley. 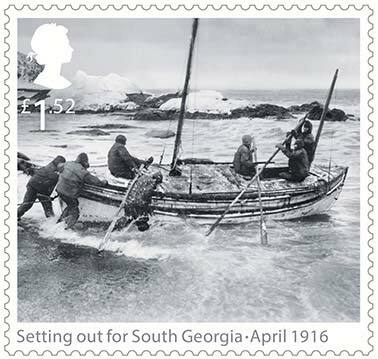 Included is a stamp showing Shackleton and crew-mates starting the 800-mile open boat journey in the tiny James Caird boat to South Georgia and safety. Led by Royal Marines Mountain Leader Sergeant Matt Hoe, a team of 11 Royal Navy and Royal Marines are attempting to follow in the footsteps of Sir Ernest Shackleton overland from King Haakon Bay to Stromness. The Grytviken Enduring Eye exhibition, showing a selection of Hurley’s images and original lantern slides was officially opened in South Georgia in January (see above). The Royal Geographical Society, Kensington, London. Scott Polar Research Institute, Lensfield Road, Cambridge CB2 1EP. Braving snow and seals: Irish adventurers retrace Ernest Shackleton’s Antarctic expedition. Explorer Rebecca Stephens follows Shackleton’s route. John Splettstoesser has passed away. Geologist, naturalist, author of polar resources. South Georgia makes the CNN top 16 places to visit. Congratulations go to Dr Kim Crosbie and Mr Jérôme Poncet, who have been awarded the Queen’s Polar Medal. Dr Crosbie received the Polar Medal for her outstanding contributions to the knowledge of Polar visitor management. Mr Poncet was awarded the Polar Medal for his pioneering efforts in supplying logistics in support of Polar science and wildlife documentaries for over 40 years. The South Georgia Island Sea Kayak Voyage wins Australian Geographic’s 2015 Adventurers of the Year award. Reclaiming South Georgia from rats: a world leading project: a world leading project. 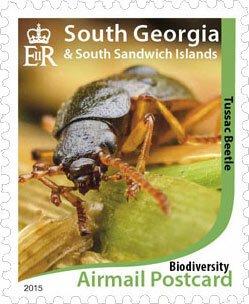 The GSGSSI newsletter will now be produced every two months. The February/March edition will be published in early April.